Dr. Gary Zank – The Smartest Person in Alabama? 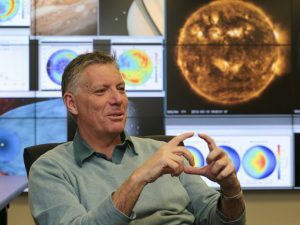 Dr. Gary Zank, of the University of Alabama in Huntsville’s Center for Space Plasma and Aeronomic Research, was recently featured in AL.com as possibly the smartest person in Alabama. An interview by Lee Roop highlighted Dr. Zank’s extraordinary accomplishments in the field of space physics. Dr. Zank’s work has also recently been recognized nationally by his election into the National Academy of Science. Please click here to read the full article about Dr. Zank from AL.com and here to read the announcement of his election into the National Academy of Science. To utilize the Alabama EPSCoR Research Capabilities Map/Database first select a research priority or a research institution from one of the drop down menus. Research priorities are organized in three tiers- primary, secondary, and tertiary. There are eleven primary research priorities to choose from, see the drop down menu for a selection, then drill down for a detailed list and points-of-contact. Alabama’s research institutions are listed in alphabetical order. Select an institution for points- of-contact and/or to view all of the research capabilities of that institution. To see the expertise at an institution hover the cursor over the red dot representing that institution. Icons will denote that institution’s secondary research capabilities. Click the dot to get more detailed information. To see the state-wide capabilities in a particular secondary capability, click the secondary capability (it will turn red and produce another map). To obtain more details, first, click on the secondary capability (turns red) then click on the institution’s dot to obtain a list of tertiary capabilities.